This photo was taken in front of the school mural in El Paraíso, which was designed and painted by the students with help and guidance from some of our group members. Everyone is now home safely, though some didn't get home until Sunday 19 August, as they had flight delays and had to spend a night in Chicago. The trip was very successful: latrines were built, murals painted, patients seen, computer classes for students conducted. The Tribal Development Commission provided a lot of support for this trip. On Sunday 12 August, a soccer game and community field day was held in El Paraíso, where the school put on events and games. 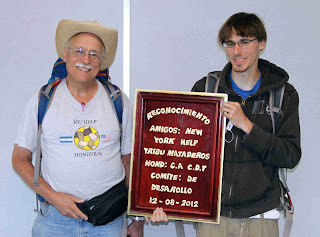 This plaque of recognition for "New York Help" was presented to NY/HELP volunteers by the Mataderos Tribal Development Commission at the community field day on 12 August 2012. In the coming days and weeks a more extensive report will be posted along with illustrative pictures. The group expects to have a meeting in the near future, to assess the trip and discuss future needs and trips. The group is now in San Penro Sula after their trip to Copan for four of them and Beleze for the other two. They will all be flying home Saturday morning. We had a good trip in the mountains. Ron, Dan and Trevor went to El Paraiso on Tuesday to do work on the latrine project. Judy, Jen and Mary Lou did a mural with the kids at La Laguna, and then went and did the same at El Paraiso on Thursday. Kathy helped me at the Clinic until Friday afternoon, when we also went to El Paraiso. Ron and I had a mobile clinic there Saturday, with Dan and Kathy translating and Mirtila coming for the day. That all went well. Sunday was a soccer match between El Paraiso and Kiloma, Paraiso won. The soccer match was just one game, between El Paraiso and Kiloma. The school put on a field day before the game, and we fortunately had enough toys left from the batch Judy brought down, to give prizes. Thanks to God! Monday Judy and Mary Lou left for Belize. Ron and I did clinic, and Kathy and Dan taught computer classes that day and Tuesday. Trevor was busy helping out in lots of ways. Tuesday Ron and Trevor left. Yovany has met all of our group, and made sure we were OK. Tomorrow the 4 of us go to Copan. Our coordinator in Honduras sent the following information this morning. Most of activities planned were realized without big problems. 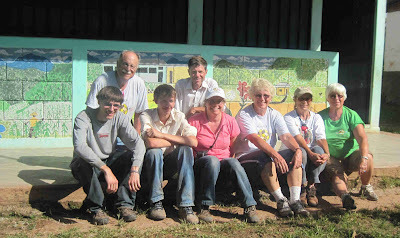 Most of 15 latrines are finished, the murals in El Paraiso created with students, teacher with Judy and Kathy are ready for admiration by everyone. On Saturday, there was a mobile medical clinic in El Paraiso. Families from Kiloma, El Paraiso and La Fortuna came. Medical attention was given principally to children, pregnant women and old persons, who have problems walking to La Laguna village (4 kilometers from El Paraiso in a mountainous and difficult trail. Yesterday, in El Paraiso, the families and volunteers enjoyed of a recreational time, with soccer game, cultural activities and several rural games (palo encebado [greased pole], corridas en costales [sack race], carrera de caballos [horse racing] and others). All of the group are in La Laguna today and four of them are coming afternoon to San Pedro Sula and the rest, are coming back on Wednesday. Something important in this trip is that the 90% of the plan, organization and development and coordination of works and support to volunteers (lodging, transport, meals, support, etc) was made by persons of Tribe and not by an external coordinator (like me). This is an excellent experience for the community and families, to organize all the work of groups, in this case, NYHelp, but in the future, other volunteers groups. The plan is that the Tribe Development Commission (TDC) can handle groups and small (or big) projects to support the development of their communities. In the next days, Judy, Mary Lou can to give more details of their experience in the past week. Everything is going well. He and Kathy Kimber have been working in the clinic. One group (Ron & Trevor Greco & Dan Beyer) has been in El Paraiso. 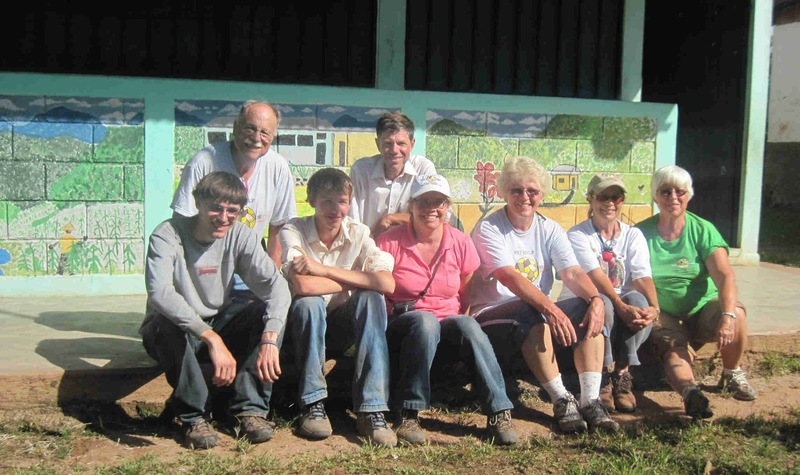 One group(Judy Toner, Jennifer Luce & Mary Lou Bogart) has been painting murals at the La Laguna school with the children. 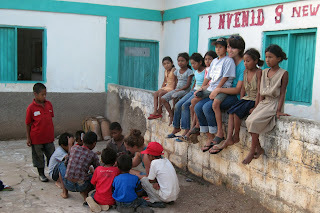 Today they leave for El Paraiso to do the same at their school. Tomorrow there will be a "mobile clinic" at El Paraiso and then all will remain there for the annual fútbol (soccer) game which everyone looks forward to either playing or watching. It's always a large community affair. Everyone arrived safely at La Laguna in the mountains. It is rainy, but no hurricane problems. Three of the group are now off to El Pariso for projects there. We are changing money this AM, then Judy will go buy school supplies, while the rest of us go food shopping at the local discount supermarket. 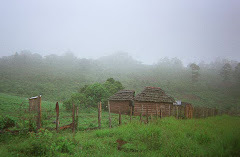 Then we leave at 11 AM for the village in a minibus. Yovany will wait for Dan at the airport, and bring him up to the village later. 7 of us NY HELP workers arrived safe in San Pedro Sula, Honduras, at 7 PM today, Sunday 8.5.12. We will be shopping for supplies Monday morning and then will leave SPS at 11 AM for La Laguna, where we will be working. We´re staying in the Hotel Maya Copan in SPS tonight. And dined on pizza, like good gringos! 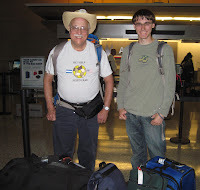 Dr Gordon Comstock and Dan Beyer left Buffalo Airport on a 6am flight that, after 2 stops and plane changes, will get them to San Pedro Sula, Honduras by this evening. The other six were leaving at different times this morning from other airports. All will be assembling in Miami for the flight to Honduras. Our prayers and good wishes go with them for a successful flight and a successful mission. More will be posted as more information is received. Eight people will be leaving from several airports early Sunday morning, August 5 all bound for Honduras . They will meet at the Miami airport for the last leg of their trip to Honduras. After spending the night in San Pedro Sula, they will buy supplies and travel to the mountain village of La Laguna to begin their work for the next two weeks. This year they will be taking 4 donated lap-top computers to be given to the middle school in Mataderos. As information word comes from then during their trip, it will be posted here. Children outside medical clinic in La Laguna August 2011. The August 2012 mission trip to Honduras is being planned for August 5 to 18. We will meet at the Honeoye UCC church on Sunday, July 15 to do our final planning. We have room to take donated (working) lap-top computers to be used in the middle school (where they have solar power). If you have one to donate, please contact Gordon & Ginger Comstock at gkcomstock@gmail.com or 585-492-2810. We are currently in need of funds for improvements to the kindergarten building in the village of Kiloma (one of the nearby villages), in addition to current projects of latrines, chicken coops and first aid kits at another nearby village of El Paraiso. We are grateful for your prayers as well as your support. NY/HELP is planning a trip to Honduras this summer. It will be Sunday, August 5 until Saturday, August 18. The volunteer group is made up of current & retired teachers, Spanish-speakers and other volunteers willing to donate their time, energy and talents to support the members of the Tolupan Tribe of Laguna, Honduras. We are currently in need of funds to support or projects in Honduras. If you would like to make a donation, or would like more information, please contact Gordon & Ginger Comstock at gkcomstock@gmail.com. We will have one more meeting before the August trip. It is scheduled for Sunday, July 15 at the Arcade UCC Church on Main St in Arcade, NY. Your prayers also help sustain us.